I’ve been around the globe many times and have visited some fabulous places, but now I have to nail my colours to the mast. 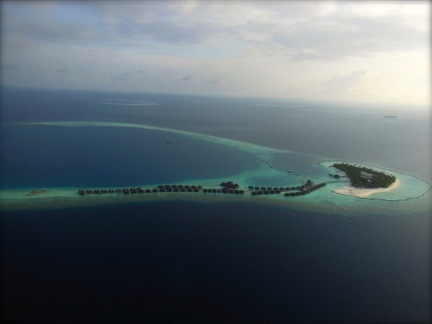 I really believe that the Maldives – that necklace of coral islands that reaches all the way down from below Sri Lanka to the Equator – must count as one of my most beautiful and relaxing destinations ever. Imagine calm seas, of so many varieties of blue that words fail me, brimming with technicolour fish. Picture soft white sands, softly blowing breezes, pĩna coladas, fresh coconut milk, exotic teas, seafood of all kinds, the wide canopy of the sky glittering with stars, and the only sounds at night the soft sloughing of the waves. Yes, it’s a pricey destination, because it’s far to travel and very exclusive, but worth every penny. Rather skip a holiday for a year to two and save up for this one – it’s the trip of a lifetime. 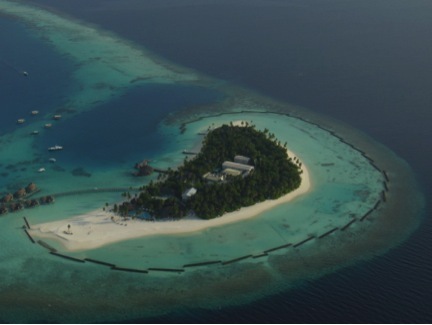 The Maldives comprises 1 192 tropical islands (although the number fluctuates as islands appear and disappear all the time), of which over 960 are uninhabited. There are no rivers or mountains on the islands, and although so many are beautiful beyond belief, they are uninhabitable. But some are now home to tropical holiday resorts of the finest kind – haunt of royalty (Kate and William relaxed here en route to Australia), celebs, global glitterati, and holidaymakers looking for privacy, perfection and peace. You’ll find when your little seaplane with its barefoot pilot touches down on your island of choice that there’s no traffic of any kind; there are no roads, nobody but other holidaymakers, and you’ll even go barefoot to breakfast and dinner. 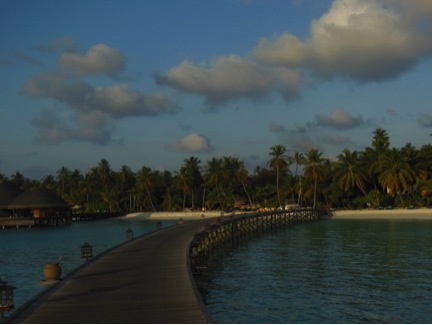 I stayed on separate islands: first at the Constance Moofushi and then the Constance Halaveli. 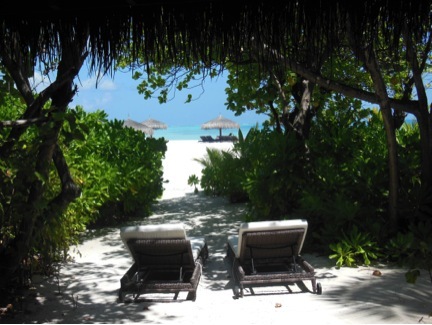 Both resorts are fabulous beyond words, but I found Moofushi more informal. 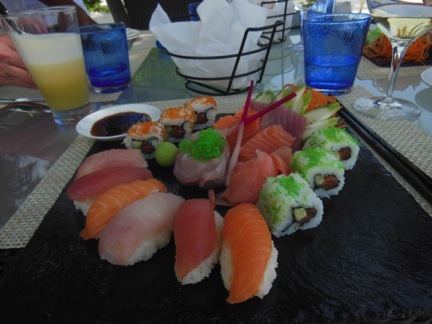 Moofushi also offers a “Cristal” package, which includes absolutely everything – from premium spirits, wines, all your food (and what food!) and your water sports, to the contents of your bar fridge, which is replenished every day. 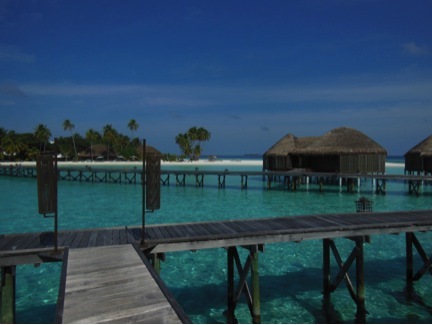 You’ll stay in a “water villa”, a suite on stilts in the Indian Ocean. 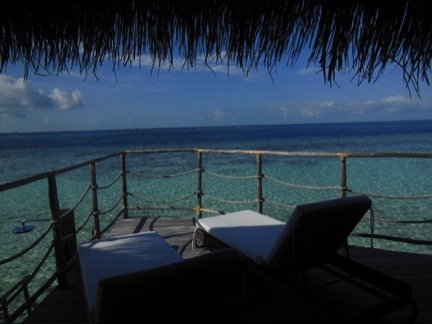 Sit on your deck and watch the fish swim all around you (everything from rays and parrot fish to people-friendly black-tipped sharks), or put on your snorkelling gear and step off your personal flight of stairs straight into the warm blue ocean. Even when the tide is in, the water around your villa is no deeper than 1m, so you can wade in and bob along to the nearby reefs and watch the Indian Ocean’s passing parade of fantastic sea life. If you’ve never snorkelled (or dived) before, now’s your chance to learn. Caring and experienced Maldivians will babysit you through the whole amazing process. It’s a long journey to the Maldives from South Africa, but believe me, after an hour on an island, you’ll feel as if you’ve been there for days already. 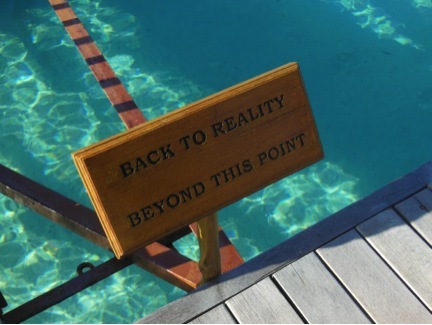 That’s how removed and relaxed you will feel from real life. All images courtesy of Kate Turkington.